Exceptional PPM and PMO Solutions™ has Planning Cards as a tool to help agile teams estimate work. Excerpts of the information and instructions—which are included with each deck of the cards—follow. This article is for those interested in getting an overview. 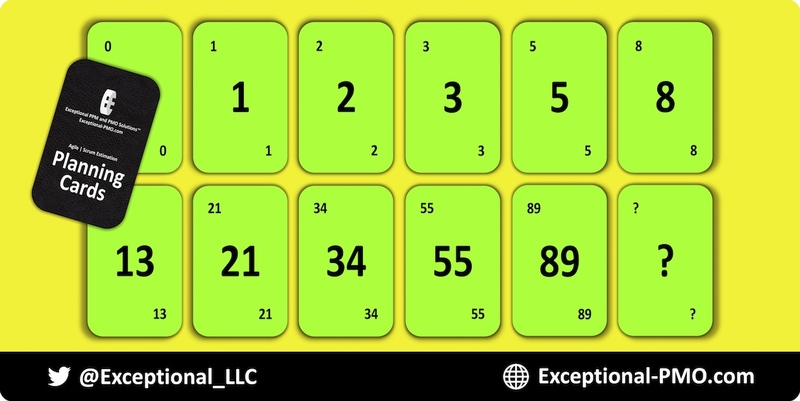 Each set includes cards with the following values: 0, 1, 2, 3, 5, 8, 13, 21, 34, 55, 89, and "?" These cards and instructions support the most popular approach to estimating work in Scrum projects—estimating the complexity of work via story points. The Development Team—which may be comprised of business analysts, coders, testers, etc.—collaboratively estimates each item in the product backlog in story points. Story points are a relative measure of complexity. Predetermined that 21 is "too large"
This article provided a quick overview of an aspect of estimation in agile projects. Further details—including more information on the Fibonacci sequence, and additional options—are provided in the book, Agile Scrum: Your Quick Start Guide with Step-by-Step Instructions. Agile Scrum is available in paperback and ebook formats at Amazon. For additional information, visit AgileScrumGuide.com.